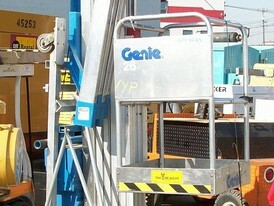 Savona Equipment sells new and used personnel lifts. Personnel Lift definition - also known as One-man or push-around lifts. They are a platform that is designed to be used by one person, and generally only moves vertically, using a rack and pinion type mechanism, or a screw type mechanism to move stages past one another. Mostly used for maintenance purposes, such as changing lightbulbs. They are typically powered by an electric motor. Let Savona Equipment find the personnel lift that you need.